Hello! Firstly, I urge you not to scroll down this blog any further as you will notice that I haven't posted since March.. of last year. I'm not going to bore you with the details but a mixture of finishing uni & going into full time work has left me with no spare time whatsoever, so one of my 'resolutions' this year is to spend more time blogging! The bag I'm currently using was a Christmas present, It’s from Zara and it’s very big, square with a long and a short handle (I've taken the long one off). The one thing I will say about this bag is that it gets heavy reallyyy quickly so I try not to take everything and the kitchen sink out with me if I can help it! As you might of gathered from the pictures above I am a bit of an OCD nut. I carry wet wipes & hand sanatiser all the time as I use public transport on a daily basis and the thought of touching rails/doors/seats and getting germs on me makes me feel very sick! Using anti-bac often makes my hands quite dry so I like to use my Cath Kidston hand cream (which I got in my stocking) because it smells delicious and leaves my hands feeling lovely and moisturised. Hand cream is a handbag essential for me especially in this cold wintry weather. I also wouldn't leave home without my little tub of Carmex, dry lips lifesaver right there. I always bring a few bits of make-up out with me as I'm usually out of the house for around 10 hours, so I like to touch-up throughout the day if I'm feeling a bit bleurgh. 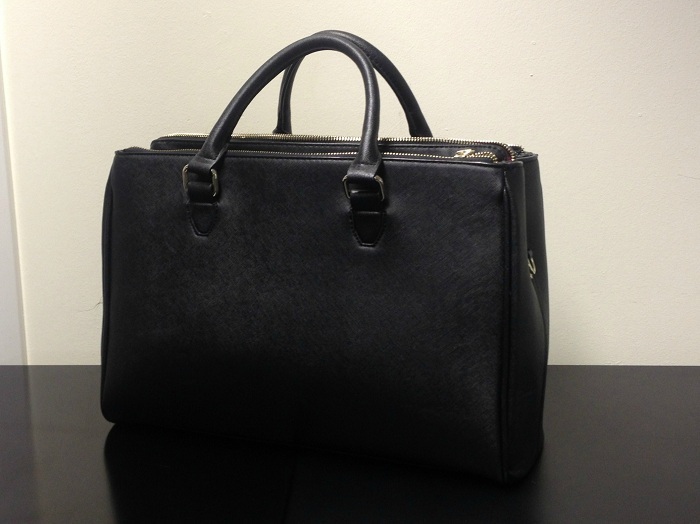 My make-up bag is from Whistles and this is another present I got for Christmas and I love it! If I'm in a rush and need to pack some essentials I'll always make sure I have a few Real Technique's brushes to hand as well as my trusty NARS Laguna bronzer & Sleek blusher in Rose Gold. If I'm looking a bit lacklustre & need a pick me up I'll use my Rimmel Wake Me Up Concealer under the eyes and add another lashing of Volume Million Lashes for good measure! Then there's always the few random bits lurking around the bottom, cue Hollister body mist, receipts, loyalty cards, nurofen & randomly my passport! I've also got a teeny tiny Diptyque fragrance sample in there just in case I've forgotten to put some on in the morning... It's not the greatest scent, but beggars can't be choosers! I know the saying goes that you should never go through a 'lady's bag but I love these kinds of posts!.. I think it's because I'm a bit of a nosy parker! 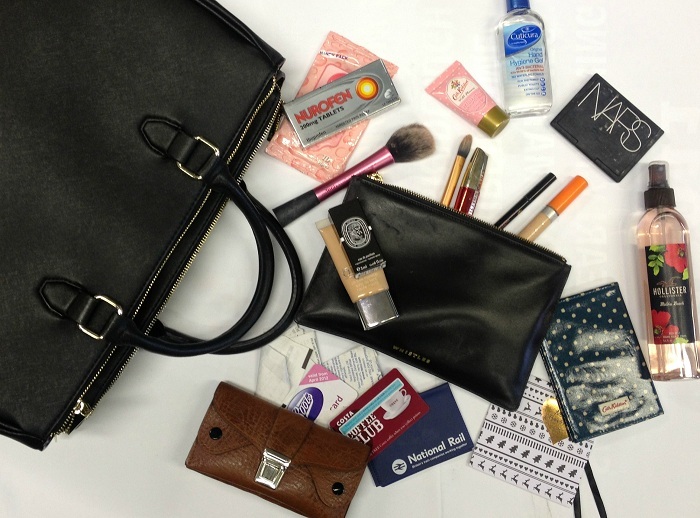 So if you've done a 'what's in my handbag' post I would love to read it.